Happy Friday my fellow 9-5’ers. Like many of you, one thing that excites me after work on a Friday, and any other night of the week, is a full body glass of wine to relax and destress from a hard day at work. My personal favorite at the moment is Yellow Tail, Big Bold Red and a close second is Baco Cabernet Sauvignon from House Wine Co, both can be found at your local LCBO in Canada. Food and wine pairings can be daunting but it’s worth trying because the right combination of flavours can elevate your taste buds and expand your knowledge. I came across this great article, 10 Commandments of Wine Pairings, and learned the number one commandment is experiment, experiment, experiment. Have fun and take your time trying different foods with different wines, you will find what you like in no time. Food and wine flavours and aromas are personal preferences so don’t let anyone tell you, “That’s the wrong combination” … simply ignore and continue on your own path of experimentation to learn what excites your taste buds. Match your weights, the second commandment, states to think about your wine and food flavour strengths. For example, bold and full bodied wines should be matched with hearty carnivorous meals and more delicate wines should be paired with lighter meals, like fish and vegetable dishes. Still confused, read the rest of the article and keep researching online. There is a plethora of wine blogs out there to help you become a connoisseur, just depends on what your preference is. Check out my favorite recipes to pair with red and white wines below. 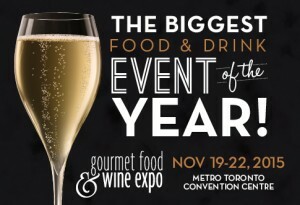 Wine enthusiasts and foodies are heading to the Gourmet Food & Wine Expo in Toronto, Ontario next week from November 19th – 22th. This is great way to learn more about food and wine pairings – you will become a connoisseur in no time! Hope to see you all there!